Our lake weed control services fight potentially harmful invasive species. Invasive species can quickly dominate the native ecosystem, and it’s important to address them in the early stages of growth before they have completely taken over and killed off the plants and animals that once called the area home. Additionally, they can make it difficult to enjoy your lakefront home because of the mess they may create along your shoreline. Different species grow at different times of the summer, so it’s beneficial to look at when you might expect to see them so you can be ready to utilize lake weed control services for their removal. Introduced to Minnesota around the 1950’s by boats and water birds. You can mostly find this plant in nutrient-rich lakes and can look like thick underwater strands of tangled stems. It can appear like a mat of plants on the water’s surface. Eurasian Watermilfoil is well known for growing extremely fast. We provide a 98% weed free area regarding Watermilfoil removal. The fun fact about this plant is that it can appear to change colors! The chameleon of the invasive plants. It usually looks to be reddish-brown in the water, but once it is pulled out, it looks green. Besides the color, you can identify this plant because the leaves are somewhat stiff and have a serrated edge to them. You’ll only see these color changers growing in up to 15 feet of water. 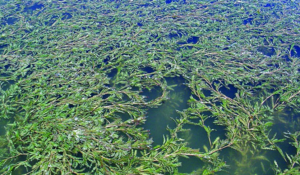 We provide a 98% weed free area regarding Curly-Leaf Pondweed. The best way to extract this invasive plant is by-the-root removal. 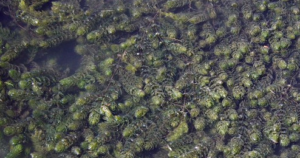 This is often seen as the “twin” of Watermilfoil. Its leaves are spiny and forked and resemble those of Watermilfoil. Coontail is a floating weed and can ride the waves’ current. We provide a 98% weed free area regarding Coontail removal. Chara can be considered algae 2.0. 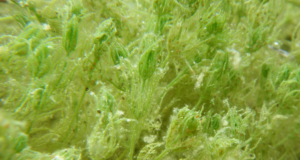 It’s most commonly referred to as a plant, but it’s really an advanced form of algae. Its skills involve stabilizing bottom sediments and providing food for waterfowl and acting as a cover for fish. We actually like to keep Chara untouched because of the benefits it provides to the lake. It helps prevent the growth of invasive species, while providing the necessary resources to many aquatic animals. 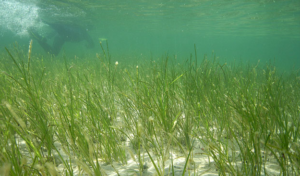 Also known as “wild celery”, Eelgrass is common in semi-shallow water. It is known by its appearance of having long, thin leaves. It can also grow up to 3ft long! Like Chara, Eelgrass can help balance the lake’s ecosystem. Like Chara, we like to keep Eelgrass untouched to further protect and stabilize the ecosystem. It is a necessity for many aquatic animals. 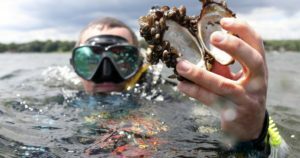 Out of all the species listed, Zebra Mussels are the world traveler, believed to have come from the Caspian Sea in Europe. Zebra Mussels get their name from the stripes on their shell and spread fast. One summer your lake may have none detected and the next the whole floor of the lake may be covered! They are extremely sharp and can hurt to step on. We can remove the zebra mussels from your lakefront. Additionally, boat owners can contain Zebra Mussels through boat inspections offered by Waterfront Restoration. Lake weed control services are our specialty. Call (952) 356-0614 or email us today to schedule your free consultation!